Recently I decided I wanted to start drink more water. For years I’ve been in an enormous drought. I used to drink only 2 to 4 glasses of fluid a day, not even water, and that was it. I knew it wasn’t great for me but I didn’t really bother changing anything about it. Recently that changed. I felt tired all the time and I had tons of headaches. I wanted to see if drinking more water could make a difference in that. Today I’ve been doing this for about a week so I can only talk to you guys about the short-term effects today, but if you guys think it’s interesting I’ll definitely write about the long-term effects later. Anyway, if you’re interested in finding out what drinking more water does to your body, make sure you continue reading! The first thing I noticed is that I have way more energy. I feel way more fresh and awake when I wake up but also throughout the day. Usually getting out of bed was practically impossible for me, but nowadays I don’t struggle with it that much anymore. It’s a whole new world for me having enough energy and I really like it. Like I mentioned I used to have a ton of headaches. Of course that’s not crazy considering how little water I used to drink in a day. Ever since I started drinking more water I haven’t had a single headache and that’s a really big thing to me. Those headaches really bothered me and they held me back from doing the things I needed or wanted to do. Now that I have way less headaches I can get so much more done in a day and I just feel so much better overall. Because I have more energy and I have less headaches I’m way more productive now. I can get done so much in just one day, way more than I used to do in a day. Aside from the health-factor, it’s also because I do feel more motivated now. I don’t really now why I do, but it might just be because I’m just physically feeling better. I’m also feeling a lot happier lately. Where I used to feel pretty crappy very often, exhausted, a little cranky, you now the drill, I’m now much more happy and excited. I’m more excited to do things, to go places and I don’t get irritated as quickly as I used to. 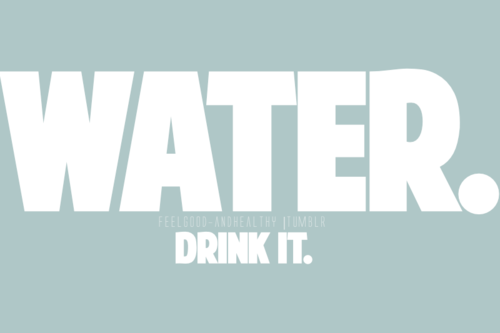 Another benefit of drinking water is that I don’t feel as hungry all the time anymore. I read that your body can’t tell the difference between being hungry and thirsty, so if you drink too little your body will think you’re hungry instead. I never really knew whether or not that was true since I figured that your body is a very complex and smart thing and I thought it would be a little weird for your body not to know, but now that I’m drinking a lot more I’m definitely less hungry so I do believe it now. The only big downside to this water drinking experiment is that I have to pee all the time. Literally twice an hour. People told me that would get better throughout the weeks but for me that’s not the case. Usually the fact that water made me have to go to the toilet insanely often held me from drinking it, but now I just take it for what it is, because the benefits of drinking water mean way more to me than the one tiny downside. Before I end this post I did want to mention this really nice app I started using to track how much water I drink in a day. I realised that without an app or any other way of tracking the amount of water I drink, I just forget about it or I forget how much I’ve already drank. Therefore I downloaded this app called ‘Mijn water’ and it’s a very basic (and free to download) app where you can keep track of how much water you’ve drank all day. It’s in Dutch and I don’t know if they have an English version, but I believe there are many similar apps out there that do basically the same thing! And that concludes today’s post. It’s a little different from what I usually do but I hope you enjoyed reading it anyway. Thank you so much for reading and be sure to let me know how you make sure you drink enough water!